Everyone can relate to the feeling of being betrayed or having someone do something to you without cause. It’s not right! It doesn’t feel good! And it’s hard to forgive in such cases. There are many who may still be struggling to overcome the results of someone’s wrong doing. You would not be human if as a spiritual person you didn’t wonder or question where is God in all of this? Although this is easier said than done, we need to wait on the Lord. God’s providence follows us into the calamity. God’s control has limited and manipulated the wrongdoing before it came to us. Did you catch what I said? God has already worked things out. Now remember I am talking about the trouble that comes your way that you did not cause. This is the same type of trouble that James says to “count (it) all joy when you fall into divers temptations” (Ja. 1:2). Wouldn’t it be wonderful if all believers trusted God enough to allow his control and not seek to fight alone? There is a clear war going on here my friends — Good vs. Evil. The real question is: Who are you going to trust? Can the wrongdoing of mankind trump the goodness of God when it comes to his love toward us? 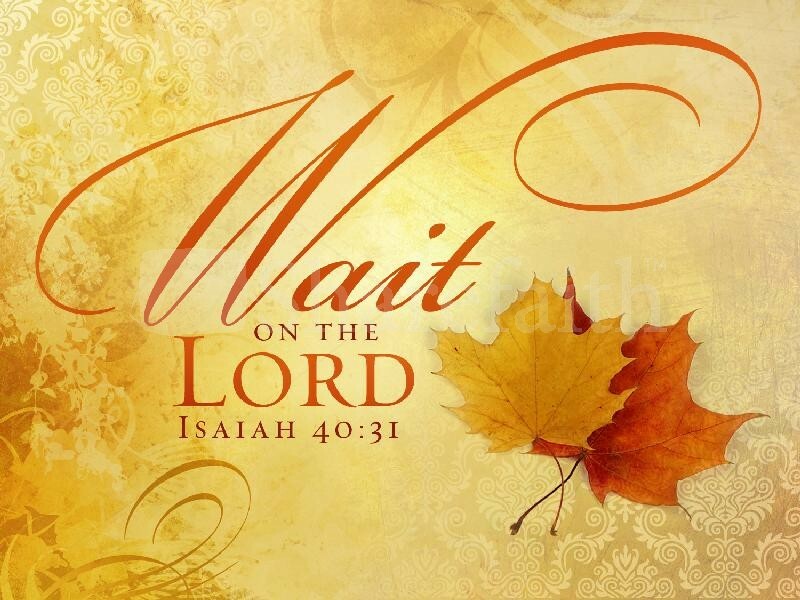 Let’s wait (on the Lord) and see! Hi clyde a old friend ask me to take kim to the doctor and I told him that I would. We spent yesterday together just talking about different things and when I got ready to leave and come home he kept asking me why u have to rush off so I stayed a little longer we listen to some music and we talked and laughed a little more then when I was leaving he gave me a big hug he’s like a big teddy bear so when I got home I called him and thanked him for yesterday and for lending me his shoulder.and for once I fell asleep before 4 am. And thank you for such kind words . Amen Bro Mayberry! We must have patience in letting the Lord do his thing. During that waiting period, that’s when we must have that enduring faith, through obedience, God is working on us, increasing and building our faith. It’s like a weightlifter who begins to train for the Olympics. He is working and building those muscles. Sometimes there are bad days in the gym (trials), and other days there Fantastic days. As the days, weeks, months, and years go by, the muscles are getting bigger and stronger. Through enduring trials, tribulations, obstacles that one faces, we get stronger, we become a “Test”imony! An Overcomer! To the sister – you are a OVERCOMER! WE ARE OVERCOMERS! Just let your light shine. Greater is “He” than he that is in the world. Jesus is Emanuel! He is with us. Proverbs 3:5 helps me in tremendously. Thanks Bro Mayberry! I needed this as I am going through a financial battle. God’s grace and his mercy is embraced with all humilty. I trust God! I am allowing the Holy Spirit to guide me and family in making good decisions. Thanks again Bro! Even when my heart is troubled I try to forgive the man that I loved and begain to trust after 25 years I just can’t understand why he wanted to kill me.to let go easier said than done I sometime find myself so angry with him and I tell him I hate him but I don’t it’s just the person he’s become. Sorry for your pain. We experience lots of things that scar us in life. The things that don’t break us, will make us. To God be the glory! Thanks for sharing! Hi clyde. You know I pray and ask god to forgive me for even allowing this man to make me so mad and wanting to really hurt this man for life but I cried and cried and ask god to help me and I pray that he gets the help he needs.I’m not perfect nor do I claim to be I never try to change him or ask him to change for me that it have to come from within so I. Just wanted him to be honest and tell me what did I do wrong is that to much to ask. Thank you clyde I konw I need to let go and move on but when you truely love someone it’not so easy so I take oneday at a time and I write letters to him but I do this and then I pray but I don’t mail the letter I guess that’s my way of getting out my anger.